A Bluetooth sensor tag with an ARM processor has tech watchers thinking overtime about what this little wonder might achieve. This is a battery-free product. Oh, did you hear that, "battery-free"? Those two words are right up there with "scandal rocks" and "lottery winner" but who are we to judge. Gawking at battery-free news can be forgiven. This week a battery-free Bluetooth sticker has been made public, and it is described as gathering its energy instead from radio frequencies. The sticker is from Wiliot, a fabless semiconductor company; it has development headquarters in San Diego and an R&D team in Israel. "We believe that disposable electronics based on battery-free, low-cost systems are the foundation for future IoT systems," said the company CEO Tal Tamir. On January 14 it showed off the sticker-sized Bluetooth sensor tag. With an ARM processor, it is powered by "scavenging energy from ambient radio frequencies," said a press statement. The team said, "It's hard to imagine how a sticker the size of a US postage stamp can power itself and talk Bluetooth to a phone, but we will demonstrate our progress publicly at the upcoming National Retail Federation show mid-January." They were referring to the event at the Jacob K. Javits Convention Center which kicked off on January 13 to 15 in New York City. The company highlighted the sticker represented "a fraction of the price" of traditional beacon devices. They described a chip glued to a simple antenna "printed on plastic or paper that can authenticate the proximity of a product by transmitting an encrypted serial number along with weight and temperature data from a device the size of a postage stamp." Wiliot's team described the raison d'etre as the basis of their development effort. 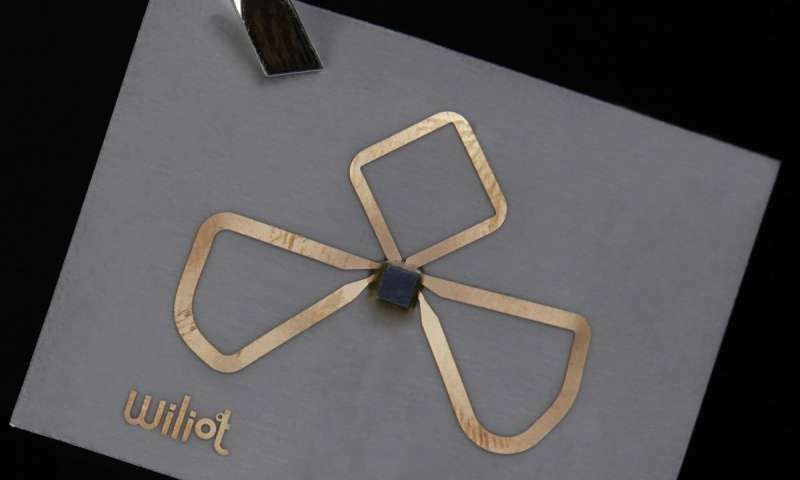 "When Wiliot was founded our vision was to create a new class of communication devices that would power themselves, be so inexpensive that they could be disposable and produced in quantities that would eventually grow, not to billions, but to trillions. We wanted to bring cloud connectivity to the things that were previously not yet part of the Internet of Things, such as packaging and products like clothing to which you couldn't attach a radio. "Bluetooth infrastructure was everywhere. They built on their vision with the recognition that radio waves are all around us. Editor for 9to5Mac Michael Potuck listed sticker chip ingredients: an ARM processor, temperature sensor, weight sensor and cloud-based decryption and authentication. They are recycling the radio signals wasted from WI-FI, Bluetooth and cellular signals, according to Williot's Steve Statler who was quoted in The San Diego Union-Tribune. "These are broadcasting all the time, but they're quite weak. The first thing we had to do in R&D was figure out how to capture those weak signals and can we get enough of them to power something." The product is not on retail yet; several sites reported on their plans. The company site talked of an Early Advantage Program later this year but Jon Fingas in Engadget said 2020 is the date for their arrival, "and you might just see these tags in widespread use soon after they're ready." The 9to5Mac's Potuck: "The company thinks a limited release of its new Bluetooth sticker chips could roll out later this year, but 2020 will be the year for a wider release." So, what types of scenarios will result from this technology in practice? Natalie Gagliordi, ZDNet, wrote about the company's target users: "The startup is eying the retail, manufacturing and logistics sectors as the main target markets for these battery-free Bluetooth transponders." One of the use cases mentioned in the company release could easily strike home—and that is use at home. The consumer "can communicate with their products to get instructions and reminders of when and how to use them, and Wiliot-enabled containers can automatically reorder themselves when empty." Fingas mentioned an interesting scenario where "Clothing could warn you when you're about to ruin your white clothing in the wash."
Potuck said the weight sensor could be notifying users when it's time to order more of their favorite food, and "the temperature sensor alerting restaurants or grocery stores when something is too cold or hot." Big deal. They have just reinvented the RFID. @hat1208 - TK is clearly a scared and jealous competitor: the article would not upset anyone else. The benefits of this technology are obvious and practically unlimited. Thanks TechXplore for the heads up - this is news I can use.